ChinaScribe: Chinese Dictionary and "Pinyinizer"
ChinaScribe is a Chinese dictionary program that can automatically add Mandarin Pinyin or Cantonese romanization and English (or other) definitions to Chinese characters. You can export the results directly to a mobile-friendly 2- or 3-line PDF document or to Microsoft Word. You can also play Mandarin or Cantonese pronunciation of words. January 2019: ChinaScribe 1.63 Now Available! To find out how the program works please watch one of the demonstration videos. You are welcome to download ChinaScribe now and try it for yourself. Using ChinaScribe to automatically create a 3-line document from Chinese text. 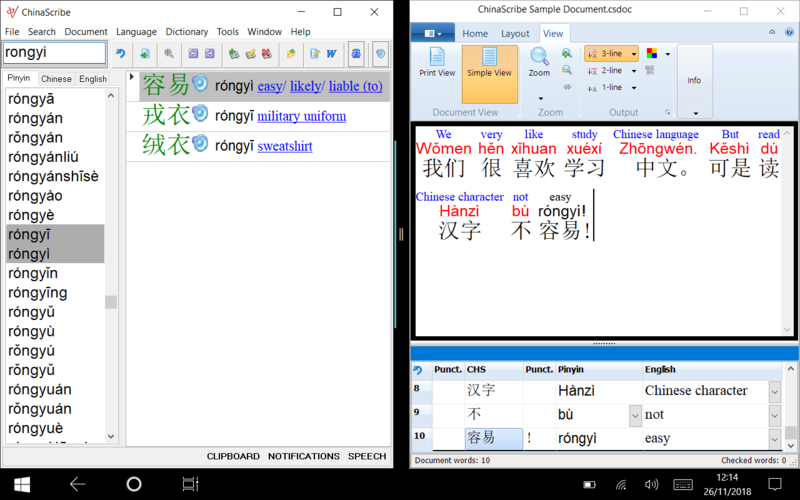 Using ChinaScribe with Microsoft Word. Copyright © 2019 David Mead. All rights reserved. Updated January 28, 2019.